Benefit Concert for Team Summer! 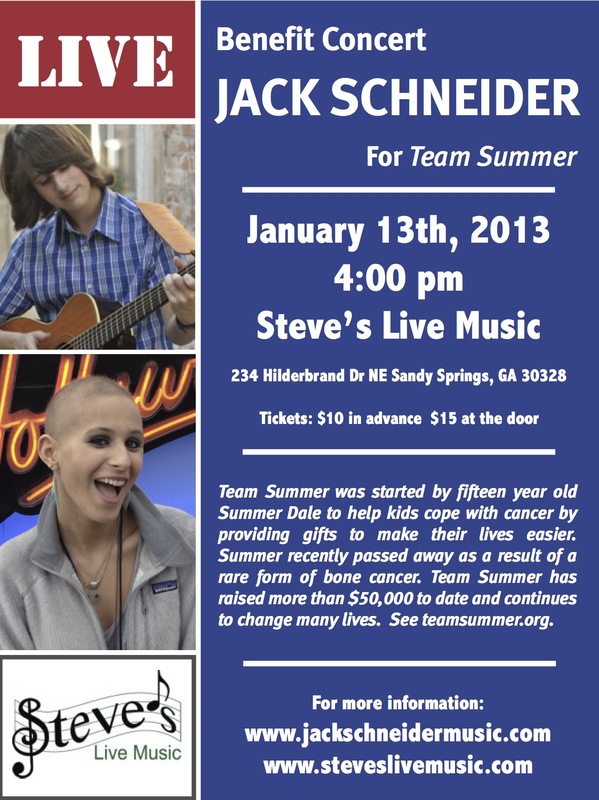 Please join us for a wonderful concert to benefit Team Summer to be held January 13th at 4:00pm (doors open at 3:30) at Steve’s Live Music at 234 Hilderbrand Dr. NE, Sandy Springs, GA 30328! Tickets are available on-line at Steve’s Live Music for $10 advance purchase, $15 at the door. We are so touched that Jack has chosen to use his talents to help Team Summer. What a wonderful example of kids helping kids! Let’s fill the house! Wow, what a great person to use his talents to help raise money for Team Summer! Will try to come.